Given the level of interest in the First World War there is currently only a handful of ‘apps’ available (compared to the Second World War, which has many), and of these many are of dubious quality. However the number will no doubt increase during the centenary as various organisations and institutions utilise the latest technology and digital media to portray their message. 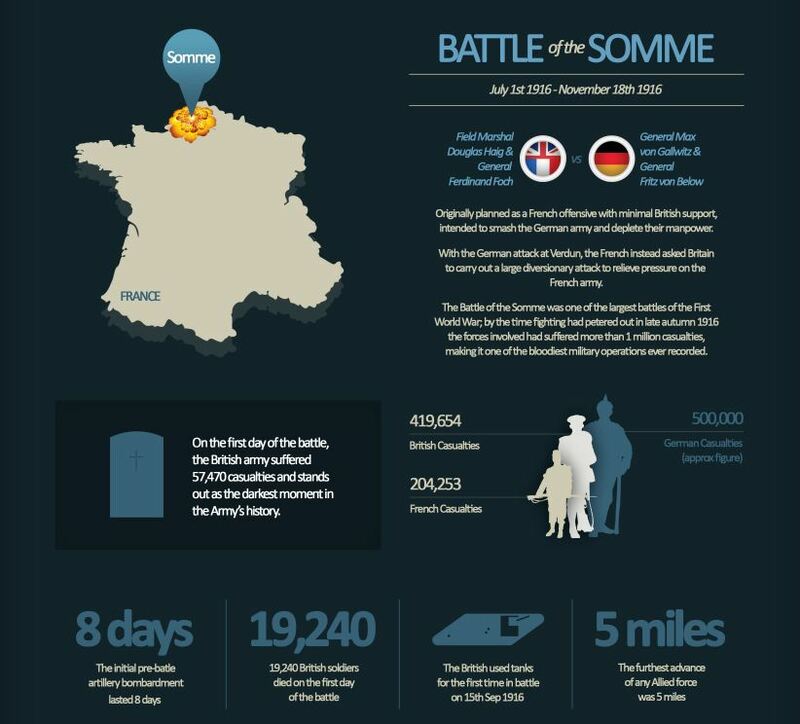 The premise of The Great War 100 is simple – a series of ‘infographics’ designed to convey some of the key facts and statistics about the war. The infographics are split into sections – Overview, Battles, Weapons, Casualties, Firsts, In the Air, The War at Sea, and U-Boats, Heroes – each containing several images. The user interface is very simple and in each section the infographics can be viewed individually or as a slideshow. The visuals are key to this app and the infographics themselves are well-designed and very clear, even on the small screen of the iphone. Each infographic has a relevant picture incorporated which is used to good effect to visually portray the facts and statistics. The amount of detail given on each infographic varies; the section on weapons, for example, shows a graphical picture of each weapon, a brief fact, and some of its pros and cons. The app is designed to appeal to both children and adults, and is also being marketed as an educational aid. The app certainly has potential in this regard, with its easy interface and summary of key information, although users should bear in mind that an active internet connection is required to view the infographics. Further updates are planned, as is an accompanying book to be published in 2014. Some interactive elements would add to the app, for example links to explore further information about the subjects shown. However for just £1.49 the app is extremely good value and provides both a handy reference tool and an excellent educational aid. 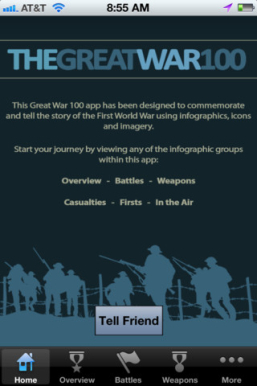 Download the Great War 100 for iphone here, and for Android phones here. For further information about the app visit the Great War 100 website.